Question: Mr Denson, when will your college start providing scholarships for Kosovo women? Today I signed the agreement with Mr Petrit Selimi from Kosovo Millennium Foundation that will make possible for the first five women to start their studies in Des Moines already in fall 2019. This is an important development and we are looking forward to hosting these women as they are preparing to gain knowledge and practical skills to become leaders in the energy landscape in Kosovo. DMACC has a long experience in subjects that are directly connected to the private energy sector. Question: What will be qualifications needed and when can Kosovar women apply for the scholarships? We will sit next weeks with MGFK in Prishtina to design a competitive and fair process for applications. The teaching is in English and the college is in America so the English language will be a requirement but I understand MFK will look into having intensive courses for those candidates that don’t speak English. 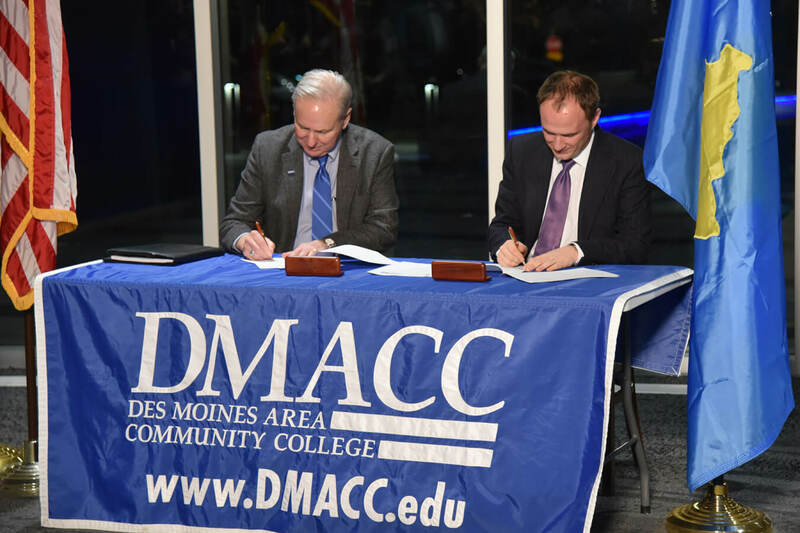 DMACC is covering the tuition fees, while MFK through facilitating private sector support, will cover all other costs during the stay in Des Moines, so there is no financial pre-condition. There is also no age constraint so we look forward to accepting a diverse set of Kosovar women. Question: Why have you focused on providing scholarships for the energy sector and not social sciences or medical sciences? Well, DMACC is one of best nursing schools in this part of the nation, but Kosovo Millennium Foundation is focused on helping Kosovo energy sector address the lack of women. I understand that they are launching a big program to help Kosovo address issues such as renewable energy and energy efficiency but the energy industry needs skilled workers. Our joint program will help start addressing this problem. Subjects we will cover are diverse, from wind turbines management to solar power to building energy efficiency. Question: Why has Iowa shown such an interest in cooperating with Kosovo? There are many delegations there? Well, Iowa and Kosovo are officially the Sister States through an agreement signed almost 10 years ago. This agreement is based on military cooperation but in the case of Iowa and Kosovo, it has flourished in all other fields. Here in Des Moines, you can buy Stonecastle wine in our shops, you can meet various Kosovars from all walks of life having meetings with Iowan counterparts and Kosovo is the only country to have a consulate in Iowa. Many people helped build this friendship not least General Orr of Iowa National Guard. The MOU we signed is opening another window of cooperation in education. I have to complement Mr Petrit Selimi and his team who have been excellent in reaching out to the American private sector and made possible we launch with cooperation now. The scholarship program will be open for other US colleges and aims to bring many more Kosovo women over next years for studies in energy-related fields, with the help of US government and private companies. It’s a great practical idea and we’re proud to be part of this massive development. This interview was published in Kosovo’s Gazeta Express on 21.12.2018. Opinions expressed in this interview may not reflect the opinions of MFK or MCC.